An environmental campaigner who is attempting to swim the length of the Thames has gone ashore to personally deliver a letter to the Prime Minister. 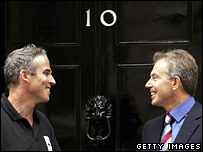 Lewis Gordon Pugh, 36, walked to Downing Street where he met Tony Blair. They spoke for five minutes about the problems facing the environment. The lawyer took up the challenge to draw attention to a WWF campaign to fight climate change. His 203-mile journey began in Kemble, Gloucestershire, 18 days ago. The finishing line is Southend-on-Sea in Essex. 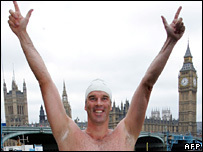 After meeting the Prime Minister, Mr Pugh said: "I think he was amazed that someone had swum almost the full length of the Thames. "He said he was proud of me. "He spoke about the work he was doing in America and he talked about empowering people at the lowest level about how they can reduce their carbon emissions. "I told him I wanted him to come to the Arctic or the Antarctic one day because I think a world leader should go there. He said he would love to come." In his letter, he wrote of the grave danger facing the Arctic as a result of climate change. Earlier Mr Pugh had said the drought and hot, humid weather had made his challenge unexpectedly difficult. "The lack of water has really slowed me down and I have not been able to keep a steady pace while jumping out of the river to walk around the closed weirs," he said.